This is the first time I have posted from my iPhone so be wary. I am currently camping in Colorado until July 9th. I will be away from a computer and my database, so there will be no updates till then. Till then I hope everyone keeps watching some great MLS games. I will continue to ponder the Impact's fall from attendance grace. They hosted crowds of 58,000+ and 60,000+ and at one point lead the league in attendance. 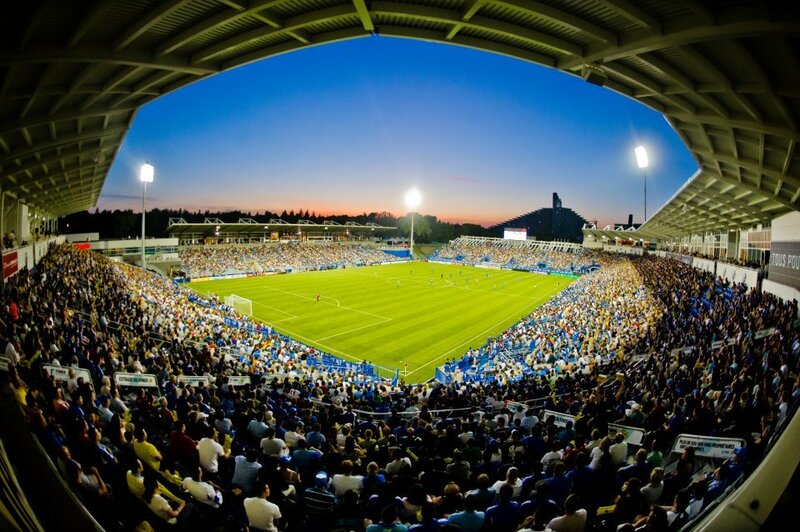 Since moving to Stade Saputo, they have recorded some terrible attendance. Their first game in the stadium wasn't a sellout and a mere 17,000 people showed up to see them beat the Sounders. Since then they have seen crowds of 12,000 for a 4-2 drubbing of Houston and 14,000 in a 3-0 loss to Toronto. I don't get it. This team is winning. They just played two of the most interesting teams in the MLS with some great talent to mediocre crowds. Oh and isn't there a source of rivalry between Toronto and Montreal? This fan base has fallen from the graces. What more can you ask for then a fun and exciting team that is winning as an expansion team. Was I asking too much to expect Montreal to continue the Canadian ways of hosting consistent crowds of 20,000+? Comments please. The MLS had a decent week in terms of attendance. It was capped off by a couple fun nationally televised games with crazy crowds. Portland earned a 2-1 victory in front of a boisterous Timbers Army while the New York Red Bulls sold out their first game of the year beating the league leading DC United 3-2. These were both fun games to watch and after seeing them, who wouldn't want to head out to catch the action themselves in person. Week 14 - The MLS is back! Sorry I was away from my computer as I was on a vacation the last 4 days. After the Euro Cup group stage break, the MLS started back up this weekend. Watching the Euro Cup has been quite a lot of fun as nothing can rival the intensity of each nation and the competition. Meanwhile, Montreal opened their newly redone Saputo Stadium to a decent crowd (17,112 and 84.12% full) as they beat up on the Sounders. There has only been one MLS match played this week. The US soccer world has been filled with USMNT friendlies to prepare for World Cup qualifying along with US Open Cup games. The US Open Cup had a crazy start this past week. It is nice to see the Cup expand to include a large field, and there was no shortage of drama as the 16 United States MLS teams joined the action. After all was said and done, the West's best Real Salt Lake were bounced by the Minnesota Stars along with many other MLS teams. Only half of the MLS teams won as the fourth round sees only 8 MLS teams joined by 3 NASL teams, 3 USLPro teams, a PDL team, and a USASA team. History has already been made, and it is not over. These teams from the 2nd to 4th division and even an adult team are playing their hearts out as the MLS puts on reserves. I know some MLS teams do not care about the US Open Cup, but there is something to be said about putting a team on the field, even if they are reserves to get a win for your team. The Sounders have shown what can be done with effort in the USOC, and isn't the bid for the CONCACAF Champions League enough of a reason to try? Tuesday will host the fourth round of the Cup. Meanwhile the US has shown a stellar offensive team against Scotland, a lackluster team against Brazil, and a just plain boring team that got out played tonight against Canada. It will be interesting to see how the US will be able to find their shape and lineup as Klinsmann has been switching between a 4-4-2 and a 4-3-3. The men will start their bid for the 2014 World Cup later this week in Florida playing a should be cake team in Antigua and Barbuda. The will then face a tougher challenge against Guatemala to finish this cycle of national games. MLS will then start back up as the world of soccer will be caught up in the Euro Cup. As to MLS attendance, it has started to level off at around 18,500 as the league looks to set even more attendance records this year. It will be interesting to see how attendance rises in the summer and how it will decline in the fall as football season kicks in. The MLS has league play all the way till October with the playoffs ending with the MLS Cup on December 1. We aren't even half way through the season, but the MLS is still expanding and showing growth in attendance, something that will hopefully catch the view of the world.